Do you know the woman who holds the Guinness World Record for the smallest waist? She is Cathie Jung, 73, and lives in Mystic, Connecticut, USA. Her waist is about the size of a regular jar of mayonnaise or diameter of CD. Cathie began wearing corset in 1983. She wears them 24 hours a day, everyday. Her waist measures 15 inches. Tight-lacing is the process of using a corset to achieve extreme waist reduction and modification of the shape of the torso. 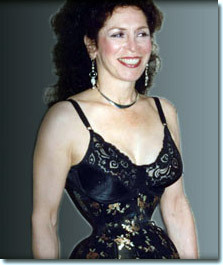 For tight lacing to be effective a corset must be worn 22-24 hours per day. This entry was posted in Beauty and well-being and tagged corset, smallest waist on December 18, 2010 by Yami.